As the surface of the sun is covered more and more, it not only gets darker but it also continuously gets colder. 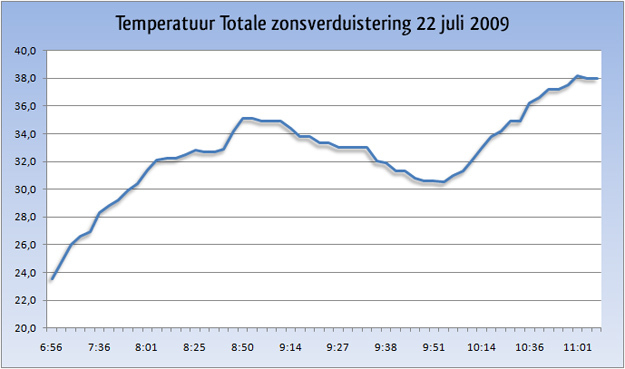 On 22nd July 2009 at 7:05 AM, temperature was 24,7° Celsius. During morning, it continuously gets warmer. At the start of the eclipse, temperature was about 32,5° Celsius. The temperature kept rising until 9:00 AM. At that time, a moderate breeze brought temperature down from 35,1° to 34,9° Celsius). At this point, 57% of the sun's surface was covered. Until just before totality temperature kept slightly lowering to 33° Celsius. During totality, the temperature dropped considerably: to 30,5° Celsius, i.e. about 5° Celsius lower! After totality temperature rose again. At 10:38 AM 34,9° Celsius was reached again (37% of the sun's surface was still being covered). At about 11:00 AM (end of the solar eclipse) temperature reached 38° Celsius. The graph below shows al temperatures. One immediately notices the temperature drop during totality!